Happy Halloween! 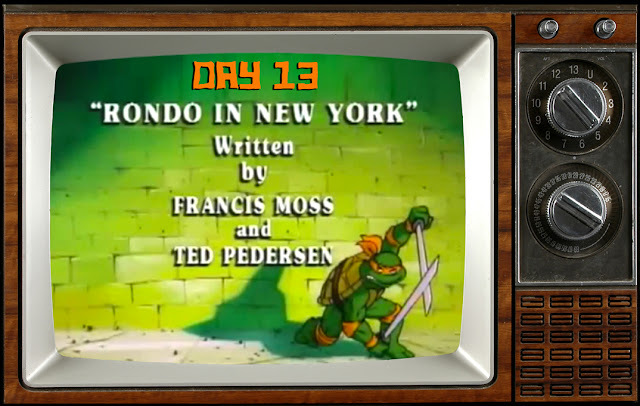 Let's make it a graveyard smash on Day 13 with Rondo in New York from Season 4! A nerdy scientist invents a formula that causes movie characters to enter the real-world. 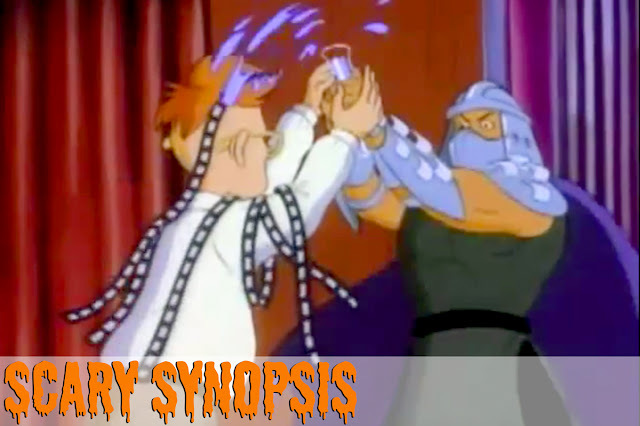 Shredder steals the mixture and uses it to bring cinematic monsters from the big screen into the streets of New York. Will these monsters mash the Turtles once and for all? Rondo in New York is a poor man's Last Action Hero. The plot is nearly identical, but lacks the cool effects and star power. We even get an Arnold Schwarzenegger-like action hero (Rondo) who enters the real-world to help battle evil. But what Last Action Hero doesn't have is insane supply of monsters. Rondo in New York is a love letter to classic horror movies from the yesteryear. There's a whole lineup of lunatics is here. Taking the front stage are monster classics such as the Wolfman, Frankenstein, Mummy, Phantom of the Opera, and Dracula. There are also freaky, hybrid villains that blend attributes from other iconic horror properties. These characters avoid copyright infringement by shifting around aspects of their appearance (see the wacky Texas Chainsaw Massacre-like dude with a club above). Lastly, there are giant creatures - big bugs and other B-movie monsters that round out this cast of freaks. Watching Leonardo fight off a a vampire is an entertaining scene. His Turtle-finger-made crucifix is especially fun. But, it's his dialogue that sends your mind to spooky places. 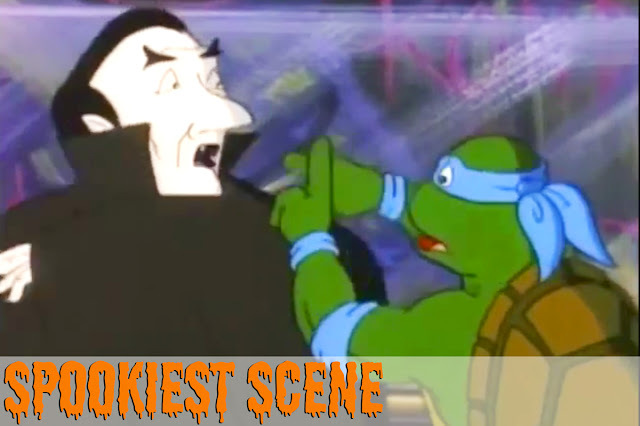 As Dracula gets closer, Leonardo yells, "No, Turtle blood is bad for you!" For a cartoon, any reference to blood is a trip into murky territory. The line hints at a real possibility - will the vampire actually bite Leonardo? This is a very frightening idea for a normally uplifting, brightly-colored cartoon. Take a look at this beastly bug. Michelangelo points out that it is the colossal monster from the fictitious movie, The Slug From Hoboken. A nice nod to the cool New Jersey town across the river from New York City. For its killer size and creepy appearance, the slug doesn't do anything. No chaotic attacking or monster mayhem. Nothing. It simply drags its big body around slower than a non-mutant turtle. 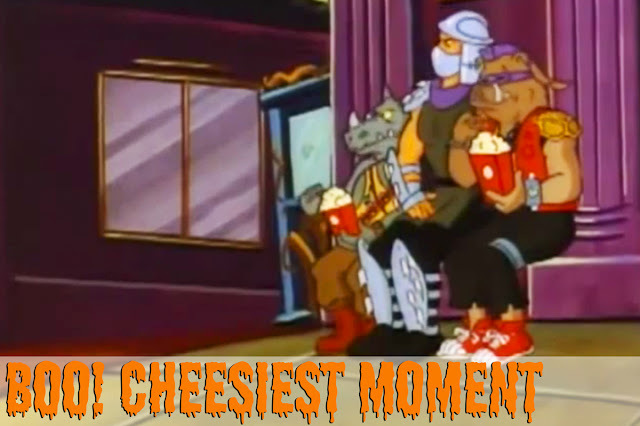 While the Turtles fight off the collection of monsters, Shredder and his goons idly sit by and watch them battle. Like taking in a Sunday matinee, they take in the scene from a comfortable sitting position and snack from tubs of buttery popcorn. Are Bebop and Rockstead the new Siskel and Ebert? Two thumbs up. Rondo in New York is the final installment of Horrors In A Halfshell. 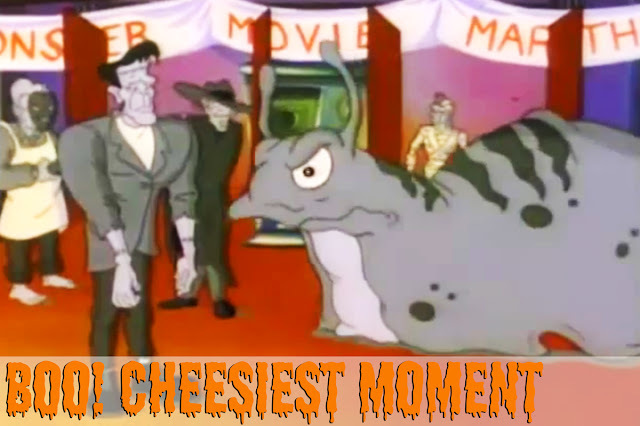 Although this series has showcased a dozen other TMNT episodes perfect for the spooky season, Rondo in New York takes home top honors. It has everything. 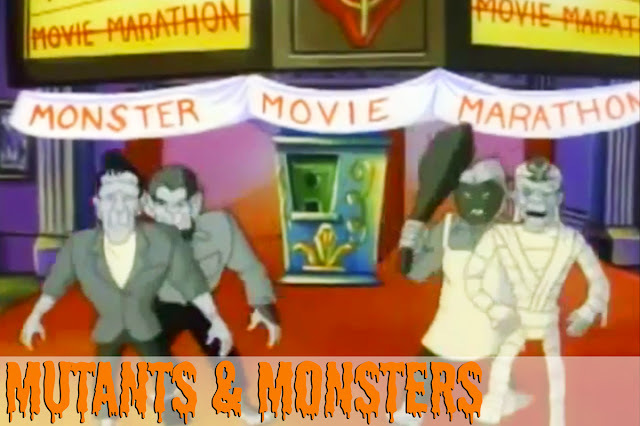 A never-ending pool of mutants, monsters, and Halloween horrors are squeezed into every scene. 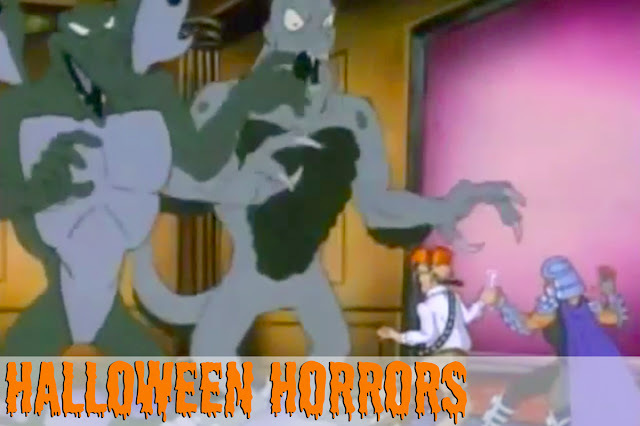 It's 90s cartoon creepiness at its best. Horrors In A Halfshell is over! Happy Halloween!